Are you looking at joining the tiny house bandwagon? Not a bad idea, actually. Tiny houses measuring between 100 to 400 square feet don’t just look cute. They also promote sustainable and eco-friendly living. Thanks to a lot of innovations nowadays, designers have found ways to make these tiny houses well-equipped and aesthetically appealing too. They are particularly customized to encourage a more energy-efficient consumption and a simpler lifestyle. At the start of the tiny house movement, wood framing was the most common construction method used. But as they become more popular, many tiny house enthusiasts are shifting towards using steel as a building material. There should be good reasons for this that you need to find out. While the upfront cost may be higher by a few thousand bucks, you’d actually realize greater savings in the long run when you build your tiny house with steel through low maintenance and upkeep cost. Your tiny house should stand up against strong wind forces, rigors of transportation, and more. It should be relatively lightweight. This alone automatically excludes concrete from the list of construction method options. The additional cost should justify the benefits. Your tiny house should be easily built and as much as possible do not require professional installation to reduce cost. There are typically three options in framing your tiny house – the standard wood framing, structurally insulated panels and steel. But for the sake of this discussion, we only compare steel framing from wood framing. Steel tiny houses are lighter -A tiny house that is intended to be moved from one place to another takes the weight as a primary consideration. While tiny houses are not necessarily transported as often as an RV trailer or a motor home, you may need to move them several times during their lifetime depending on your local codes, life changing events or a resale. It is for this reason that portable tiny houses are also built on trailers just like a motor or RV home. Trailers have weight limitations depending on your state’s regulation and that means the lighter they are, the better they would be. A lighter trailer can save you cost on heavy load options. You may even get to choose the type of vehicle to tow your tiny house. A tiny house made of steel are around 30% lighter on average than its wood framed counterpart. That’s already a huge difference in such a small-scale structure. They can be as much as 60% lighter. Tiny houses made from steel are more secured than wooden homes – They are offering a greater sense of security owed to the fact that screws and bolts are used to join them together instead of nails. While nails could easily loosen especially during transport, screws and bolts remain intact despite debris, potholes, and bumps that can potentially damage the structure of your tiny house. 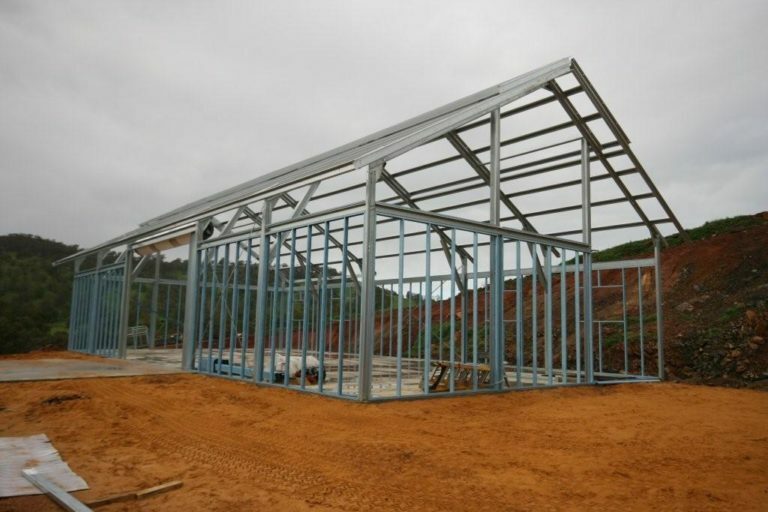 Steel buildings are stronger than wooden structures – Steel is obviously a lot stronger than wood. Its tensile strength is in fact rated at over 700 which is far higher than woods at only around 40. That equates to steel structures around 18 times stronger than wood-framed versions while being 30% lighter in weight. Tensile strength measures the ability of a material to resist breaking under tension. This property could be even further improved through welding. Steel-framed tiny houses are consistently straight – Since they are pre-engineered, the metal frames and panels remain straight. Not to mention the fact that steel does not rot or warp over time. That allows for a more consistent built. Moreover, there is a fewer construction waste as culling wood members is not necessary to find the straight sections. Steel can be coated with galvanize to enhance durability – The need to ensure that your house is durable and can be able to withstand natural elements, extreme weather conditions, fire and pest infestations cannot be overemphasized when it is tiny. Repair or rebuilding is easy for houses measuring more than 400 square feet as you and your household can easily transfer to another section of the house until the reconstruction is completed. That isn’t possible with tiny houses. 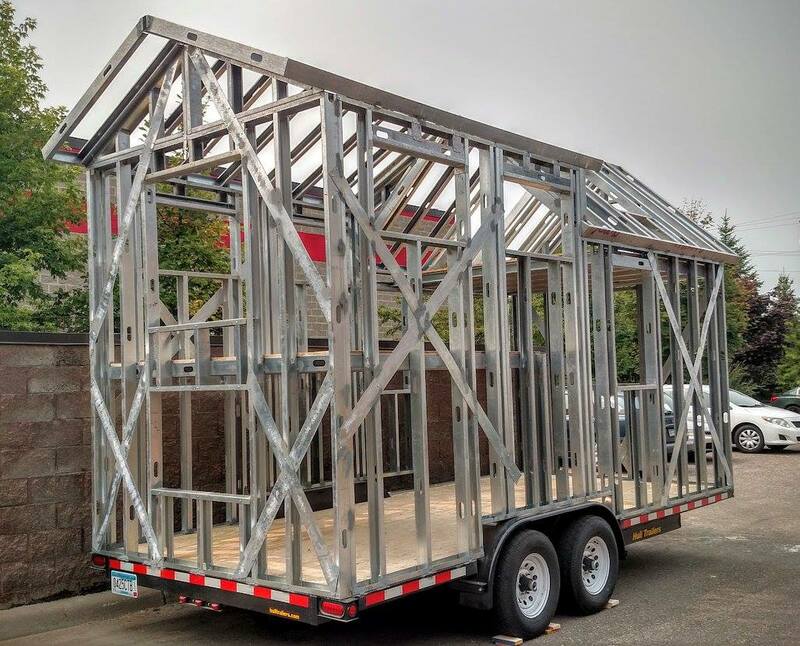 To ensure that your tiny house is protected from fire, pests, rotting, and growth of mold and mildew, you can use a galvanized steel or specially coated steel to build it. Steel is among the most sustainable building materials – Do you want to reduce construction waste and keep their adverse effects on the environment to a minimum? 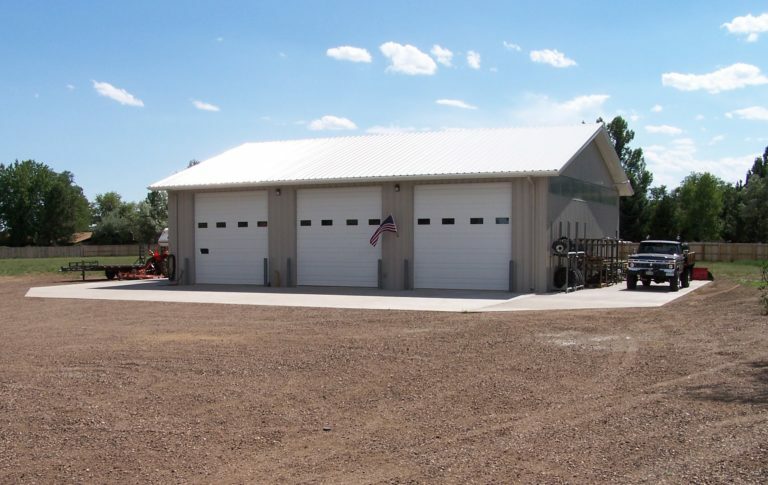 Using steel to build your next home is an effective way. Steel is composed largely of recycled materials during its manufacturing process. This characteristic coupled with the fact that it too can be recycled at the end of its lifespan contributes to its sustainability. Steel is, in fact, the most recycled material in the world with over 80 million tons of it recycled every year. What is great about this material is that even when it is recycled for multiple uses, its integrity is never sacrificed. It remains reliable. While wood-framed versions of tiny houses may argue that recycled lumber from an old home or barn has the same sustainability with steel buildings, it is noteworthy to highlight that today’s generation lumber cannot be compared with those milled a century ago. Modern lumber has a relatively much higher moisture content and is thus more vulnerable to molds and warps. 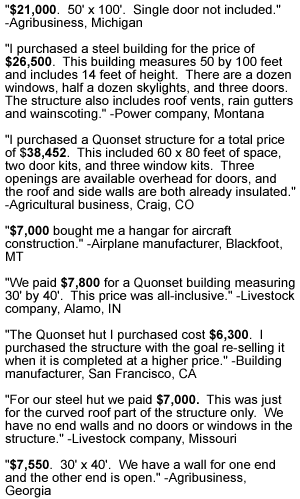 If you want your tiny house to last for decades, you’d never go wrong with prefabricated steel components. They are in lighter, stronger and tougher, in general. Some manufacturers even offer 40 to 50 years warranty at no additional cost.